jesse and i just went out to breakfast, mmm, gluten free pancakes! and then we went to the library, i had some books waiting, and starbucks. i also went to la tienda, a cool boutique in ballard and got my sister's birthday presents! :) and managed not to buy anything for myself but i can't promise i won't go back! they have gorgeous scarves and jewelry and clothing and ceramics and .. i could go on. they also are known for their celebration of the day of the dead, so the place was very festive and one of the clerks was wearing traditional mexican folk dress. 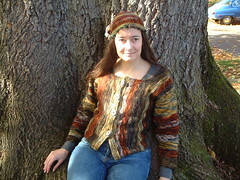 this is a picture jesse took of my new sweater i knit, modified from knitty.com's sonnet, and a hat i crocheted. this is a peek of what i have been working on this week.. i listed these on etsy. now i wish i had more time for beading and that my right shoulder was a little more cooperative. 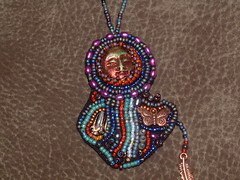 i think i need to take a beading break now and go read! 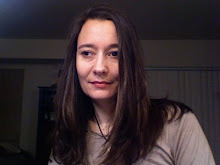 i have been reading the Homer Kelly mysteries by Jane Langton, which I like because they include a lot of history of the area where she lives - Concord -- home of the Alcotts, Walden Pond, Thoreau, Emerson, etc. Also it was a pivotal point in the American revolution and the civil war - so just brimming with history. However I am waiting for the library to bring me another one in that series so i will have to find something else to read. Last night I read in one sitting Ebb Tide by James P. Blaylock, wonderfully eerie and whimsical steampunk fiction with a dash of Robert Louis Stevenson thrown in. I'll find something to start on tonight . 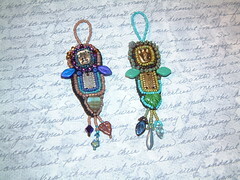 i am working on some angel ornamnents for my etsy shop for the holidays. this is one i made last year. the current batch will each be quite different. the faces will all be different as well. the face shown here is by RAMA, but that company no longer exists, and i will probably save my small hoard of rama faces for gifts. the angel i made last night had a sliver face. i am also working on some small pen and ink drawings for the shop, which will come matted in a simple black or white matte. good gifts! i will try to have everything pretty reasonably priced. in england hedgehogs are sometimes called tiggys, hence beatrix potter's heroine mrs. tiggy-winkle. they are also called urchins. 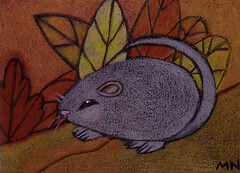 this is just a little note from me that i listed 3 little works of art on etsy, this being one, and also a little mouse and some autumn leaves. i need to get someone to take a picture of this ON me soon! 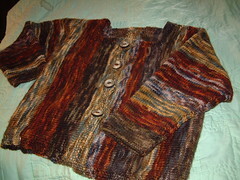 this is a sweater i just finished knitting. it is based on Knitty's Sonnet. i have done it in stockingette stitch with a seed stitch boarder and done the sleeves as 3/4 length sleeves. the yarn is Manos del Uruguay Wool Clasica in Olivewood, Prairie, Granite, Moss, and Adobe. squeak! this is how i feel right now - like hiding in the leaves. 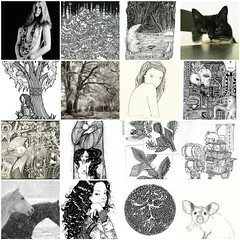 but i am hear to tell you that i listed some things on etsy and i hope i will feel more like unhiding soon. been reading a lot lately and drawing and painting a little and sleeping a lot. 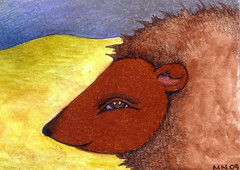 oh goodness, and i thought i had nothing new to show you.. but here is smith the hedgehog! at least, the pattern is named smith. I call this guy Tiggy. he's a gift for a friend. The pattern is by Ysolanda Teague. 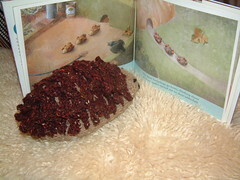 He's reading The Three Hedgehogs by Javier Saez Castan. 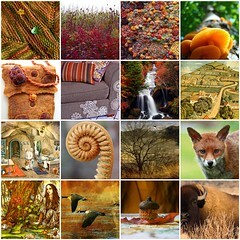 here we have some inspiration for autumn. I hope i get some good art-making in this weekend! then i will have something to show you, and sometime to blog about. in the mean time, i hope this inspires you - it did me!